At the time of writing this, I just settled down in my chair here at work (my real work) after this morning’s commute. I’m 10 minutes early to work, which is pretty rare, even when I’m moto-commuting. I was so excited to ride the NT650 again this morning that I didn’t bother sleeping in a few more minutes after my alarm woke me up, or even pace myself during breakfast to make sure I get to work just in time – not early, not late. 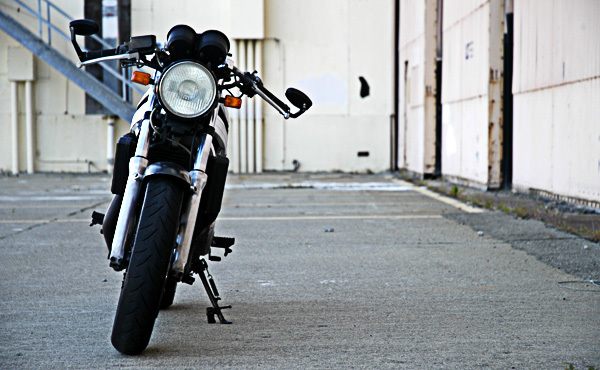 Then, as soon as I got to the garage here at work and parked the bike, I almost turned the bike on again after switching it off – I just wanted to keep riding. I have NOT enjoyed a bike and how it rides as much as I do the NT650 for a very long time now. If this is the infatuation stage of a bike ownership, I’ve never been this infatuated. And I can’t believe it’s over what’s effectively an entry-level naked bike. And that it’s over a Honda, a brand that – admittedly – had never stirred my soul. And that it’s over a bike that is a quarter-of-a-century old. There are so many things I can list to illustrate how – on paper – I shouldn’t be this excited about the NT650. I mean, a 5-speed, 650cc V-Twin on a naked chassis? It’s really half the bike my 2000 Aprilia RSV Mille was! But it’s a hell of a ride, even when I jump straight from my R1 and onto this one. Even when parked in tandem with my R1 in the garage, it holds its own and doesn’t look out of place – just different. But it fits the bill, and it fits right in, and from the first time I rode it and in this first week I’ve spent on it, I feel right at home on it. And even if it may look every bit like it’s not made for someone like me, it’s turned out to be exactly what I’ve needed lately. 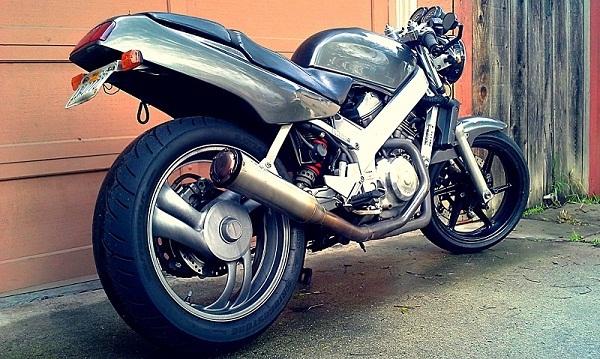 My Aprilia may have been a V-Twin, but it was a liter sportbike. And though I loved that bike, my V-Twin experience has been washed by the numerous inline engines I’ve owned – parallel twins, triples, fours – before and after, at a ratio of about 13 to 1. So the NT650 is a nice return to V-Twins, but a fresh experience as it’s a smaller displacement than my Aprilia, and it’s a naked bike rather than a faired sportbike. Its sound and feel is a throwback to my days on the Aprilia, but it’s a very fresh experience now. The bike and I have some acquainting to do, but we feel well-acquainted already. I know I’m just gushing over the bike at this time, and though I’ve written many words I probably have yet to actually say anything remotely useful to anyone. The infatuation will surely wear off, and by then my rose-colored visor should be lifted and I can string together the words that actually tell the tale of what it is about this bike that does it for me (or doesn’t). Until then, let me have my pleasure before we get down to business. Read Part 1 to my NT650 affair here.